It has been a long time coming, but the ETSY Spotlight Feature on my blog is finally returning! I love ETSY so much, and love celebrating other ETSIANS and I am looking for shops to feature, handmade, vintage, supplies — I’m considering all kinds of different shops to feature. Let’s start celebrating the wonderful ETSY community! Googling is one great way to seek out articles that have advice on how to improve your ETSY shop, but an even better way to get the information you need from your own ETSY peers is in the Critiques Forum. Many seasoned sellers will be the first to jump in and give you advice on why you are not selling, why an item has low views, or give you an overall critique on things that you can improve in your shop. When I was new I struggled with my pictures, and received wonderful advice from other sellers. It can be hard to hear sometimes, but constructive criticism will only help your shop grow. Remember, the reason you are going into the forum is to get vital information to help boost your sales so if you get harsh critiques just know it’s because they want to help you! It’s July, and yes many sellers on ETSY are already planning the most busiest season of the year: the fall and winter season. Why so early? Planning ahead is always a good idea, you want to be ready. It would be a shame to be half way through the season and realize you weren’t ready for it. I started season planning last month. My shop Natural Amber Designs will be running advertisements and special promotions throughout the season. So as a seller what can you do to start planning for the busy season? * Stock Up Shop Now. Currently I have 226 listings in my ETSY shop, 48 in my Artfire and I am planning on adding my entire collection of jewelry to both Artfire and ETSY. My plan is to have close to 300 once September/October rolls around. * Have a Plan, Stock Up. Stock up on the essentials, tape, mailers, gift boxes, tags, bags, you don’t want to be out of the essentials when the orders come in, it could delay orders from shipping out. Make sure you are ready! Remember, it’s never too early to start a business plan, a marketing plan, or an advertsing plan. The more you can get your name out, and the earlier make your chances better of having a successful season. I keep myself busy by crafting new items, stocking up shop, making my shop colorful and pretty (I made a new banner!) and focus on a new plan of attack for the upcoming season. Don’t worry, the slow season is almost over, and August is going to roll around and so will your sales. * PICTURES. PICTURES. PICTURES. I can not emphasize this one enough, pictures are what draws customers to your shop so they need to stand out, they need to look professional, and they need to be free of clutter. When I first started it took me more then 6 months to look at my shop constructively and realized I wasn’t selling because my pictures weren’t that great. I can always improve on them, but the step I have taken in re-doing, using a light box and freeing distractions has boosted my views tremendously. * PROMOTE. PROMOTE. PROMOTE. Etsy gives you the shopping cart, gives you the storefront, and gives you the ability to sell online but that does not guarantee buyers. I think alot of sellers come to ETSY thinking that all these buyers are going to find you in search (I know that’s what I told myself for more then 6 months) and then become discouraged when the sales aren’t coming. In a saturated jewelry market there is no way I could rely on ETSY alone. Make sure you are promoting locally, use social network sites, get the word out that this is your shop, come visit it! * MAKE WHAT YOU LOVE, DON’T COPY WHAT SELLS. It is more then okay to sell things that are popular, but I hate when I see a million sellers selling the same idea copying each other because it is what buyers are buying. I think it is more then okay to run with an idea, make it your own, but don’t copy those silver earrings because the other girls shop sells them quick. Customers like being able to see a picture, see a piece of jewelry with your trademark style. * DON’T FORGET TO NETWORK ON ETSY.Hearting, participating in the forums, participating in teams, and participating in chat is a strong way to network and gain buyers on ETSY. I can not tell you enough how many times I have bought supplies from sellers who hearted my work, and have hearted people back with intention to buy (especially during the holiday season). Often times buyers are lurking in the forums as well and love clicking on awesome avatars hoping to find a handmade or vintage treasure to buy. * START A BLOG. I have learned so much from other people’s blogs which in turn has made me want to visit their shop. Blogs are a great way to get in touch with community, let others know what you are doing, and a great way to start a customer base who loves seeing your newest items. * BE POSITIVE.I am one of those people who gets turned off by negativity, calling out, downing another sellers items to make you look better, it makes me never want to buy from that individual. You have to remember that many sellers are buyers, and many buyers lurk the forums and may find being that way as a turn off as well. I always try to stay professional in the forums, and give people the impression that I am a helpful, courteous, and positive seller who embraces the handmade/ETSY community. The forum on ETSY is a wonderful way to get to know other sellers, a great place to get information that can help you sale and get information to improve your shop, and a great way to get encouragement when you are feeling discouraged about your little store, but lately and more often I have been noticing a trend of forum posts about low views, no sales, and calling out. Many of these threads seem to be more on the negative side then the positive. I think it’s wonderful to discuss things that are affecting your shop, but we always have to remember that there are buyers on the forums (many sellers buy too) and often time a discouraging and negative post could keep from someone clicking your avatar and seeing all the wonderful and pretty handmade and vintage you have inside. * Was I doing enough? * What are other sellers doing that I am not? * Am I really, I mean really reaching my target market? After sitting awhile, asking myself those questions I came to realize, No, it’s obvious I am not. I know I make a great product, if I didn’t people wouldn’t buy from me at all. If I made a bad product, I wouldn’t have 33 happy feedback reviews. So where do I come from here? Where does any struggling handmade artist go form here? Back to the drawing board. Back to the little room to brainstorm a new business plan. Question 1: Was I doing enough? I realized that I was not doing absolutely everything I could to bring buyers to my site. ETSY gives me the tools to upload my work and setup a cart. It is my job as a seller to help buyers find me. I can not rely on ETSY alone to bring me buyers. What was I neglecting? * Marketing locally. The coming weeks I am going to start looking into local farmer markets, places to pin up my business cards, talking to people and marketing myself as a jewelry artist. I never focused to much outside of the Internet. Mistake number one. * Keeping my Blog up-to date. This is my first article on jewelry and selling on ETSY in a long time. I used to get 50 hits a day, and many of those hits would then result in people looking at my jewelry store. What I need to do is make sure I am writing a few articles a week on relevant topics. * Find Affordable Advertising. Marketing can’t always be free, and what I need to remember is that you have to put money in sometimes to get results back. There are alot of great places a small handmade artist can advertise on, I would look at local magazines, magazines about the craft you make, or even ask your local newspaper about how much an ad would be. Question 2: What are other sellers doing that I am not? There are good reasons why one ETSY seller is more successful then another ETSY seller and I think it is a smart idea to pay attention to advice many of them give on the ETSY forums. Many of these sellers bring outside customers here, pay for advertising, have a strong local market, have a great product with great descriptions, clear and appealing product pictures, and know their target market. What can I learn from them? * Be Objective to your Listings. You have to be honest with yourself, and you have to be able to give yourself constructive criticism. No one wants to criticize their own shop, but the best thing you can do for yourself is to look at your shop objectively and as if you were a new buyer finding this new shop on ETSY. Would you buy your items based-on your pictures? Your descriptions? Your prices? * Look at other similar successful shops. You can get a good idea on why a shop on ETSY is more successful. I like to look at the “Quit Your Day Job” articles on ETSY, many of these sellers have great ideas and they have beautiful shops! Question 3 Am I really, I mean really reaching my target market? If the sales are not there, and you know you have a great product then there is a good chance you have not found your target market. I am very surprised when I talk to other artists about target market, how some do not even know who they are marketing too. My market for example are woman who love to wear jewelry made from natural materials: gemstone, wood, and shell. Have I found my market? I don’t believe so. A great place to start is marketing locally. Perhaps there is a trendy cafe you think would be a great fit for your business card based on the customers who go there. You have to be creative. You have to know where to find your target market. I am excited to start getting back into my shop, marketing more efficiently, and really, I mean really focusing on becoming more successful, and more happy knowing that I did everything to put my best foot forward. Are you ready to do the same? 1. Always respond timely to your conversations. If you are having a high volume of sales and are having trouble responding, you may want to consider hiring someone to help you part-time. 2. Keep the lines of communication open. Let your customer know when items shipped, when they are planning to ship, and how to contact you if they have any questions or concerns. Remember the holidays can be fun, but also stressful for many buyers. Please remember to keep the line of conversation open to relieve those stresses. 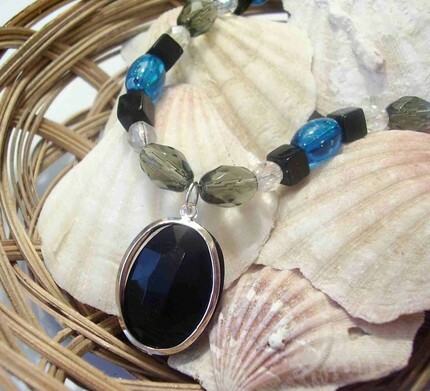 Love the item above, come see the Black Pendant in my shop! Handmade Jewelry has always been a popular category on ETSY, as well as competitive so often times an artist can find their work buried quickly among the category. Then the idea and philosophy of “re-newing” became popular, a way to renew older listings and get them back at the top of the category for more views, and potentially another customer! So when do you know you have been renewing a little too much, when do you know your are breaking the bank with renewing fees, when do you know you may be a renewing addict? 1. Every morning you wake up and feel the need to renew 3 or more items in your shop, even though you just listed them in the last 48 hours. 2. In the middle of the day you feel the urge to check your views, when you feel its been more then 10 minutes and no new views you proceed to renew three more items. 3. When you get home, and see your renews from earlier today only gained you little momentum, one new heart, and no new sales you proceed to renew another 3 items in hopes to generate another sell. 4. You have renewed more then 4 times a week, or more then 15 listings a week. So waht can you do to break the addiction of renewing without your significant other finding your $60.00 ETSY bill? 1. Start out slowly. Feel the need to renew, renew only one item. If you need to, renew no more then three times a day. 2. Find Other Venues to Sell In. Dont abandon ETSY, but also channel your money and advertising into another venue. I recently started shop on ShopHandMade.com, and I am starting shop on Dawanda. Both have low fees, and some have none at all and I am feeling the need to not renew as much. 3. Channel Support From the Forums and Chat. There are many others who have the button finger and find themselves in the same pattern of throwing money out the window to renewing. Start a thread, and others will come and support! 4. Sit Down and Account. Really want to know how much it is costing you? Break it up all your costs and your profit. You may get so disheartned by the numbers you’ll stop cold turkey. Come up with a plan, and stay with it. Don’t throw your hard earned money out the window! Love the bracelet above? 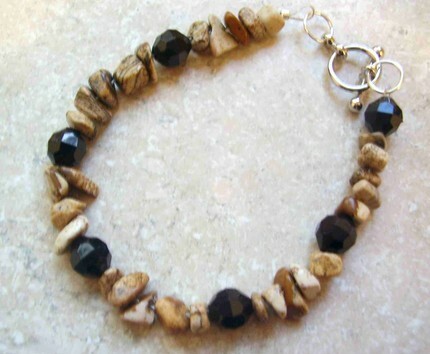 Come see My Picture Me Jasper Bracelet.